"These books provide a great service to the community of people out there who know very little about law." 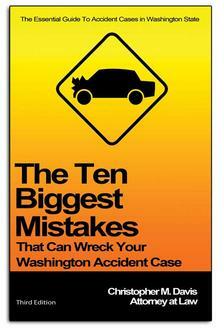 The book: "Washington Injury Law" by Christopher M. Davis is very well written for the "common" person and very informative also. Great job! These books provide a great service to the community of people out there who know very little about law. I personally find the study of law, and the process, very interesting. I would read all your books if I could... I like them that much! One never knows in today's world, etc. I will definitely keep your firm in mind should the need arise, etc. These books are a great introductory tool for your firm and a great way to learn about how the legal system works. "....going above and beyond in researching my case...." -Gabrielle H.
"If it wasn't for the Davis Law Group I don't know where I would be" -Damon M.
"I highly recommend the astounding team at Davis Law Group." -Justin S.
"I really appreciate the hard work." -Sharon H.